Single Flower is a simple pattern, unspectacular in concept but available in a desired shape. It is named for the design on its reverse because its face is mold unpatterned. Single Flower is a pattern misnomer, as it is character-ized by three floral sprays, each with two large blos-soms, two small flowers that are just opening, and leafage. Three mold lines split each spray down the middle. Single Flower pieces rest on an elevated base, an element unique to Dugan, rather than on more conven-tional collar, ground, or domed bases. The elevated base is extended upward, a lift of about an inch to where the bowl begins to flare. A large nine-petaled leaf and three small open flowers are pressed into the underside of the three-inch diameter base. Usually found in peach opal, a key to attribution of manufacturer, Single Flower is probably exclusively Dugan, made in carnival before the plant was reorga-nized as the Diamond Glass Company on July 1, 1913. Seen most often are bowls in a number of edge treat-ments, but a basket with an attached handle is also available. Dugan’s largest baskets are banana-shape bowls to which a looped, usually clear crystal handle is fused to the bowl at its narrowest point. These baskets come in two different edge treatments: one with a non-crimped smooth edge, the other with square- or broadly-ruffled edge. Both are pulled in at the point where the handle is attached to the bowl. All reported Single Flower baskets are ten square-ruffled. The bowl of the basket measures from about nine to just under nine and one-half inches long and from five to just under five and one-half inches wide. They stand from slightly under five and one-half to about six inches tall from base of bowl to top of handle. They have been reported only in peach opal. 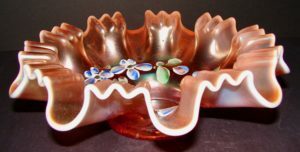 Until Tom Burns posted photos for the 2017 Tampa Bay convention auction glass, most collectors probably assumed all Single Flower baskets were made with clear crystal handles. But this one was different. 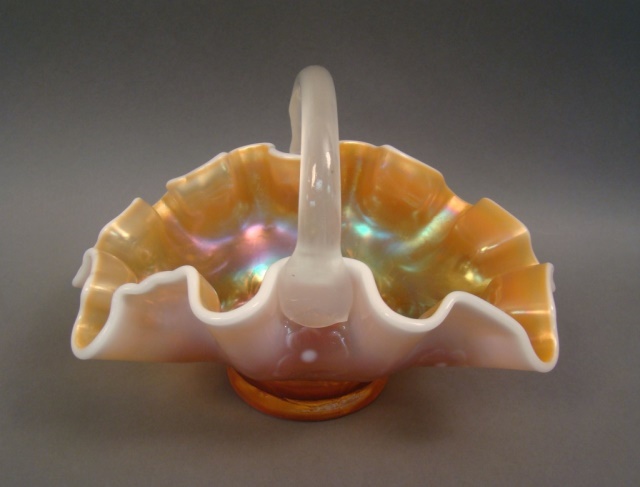 In the catalog, Tom described it as having an “unusual opaque handle.” It looked like it might be opalescent, but it is, instead, camphor glass1, a cloudy and frosted glass with a translucence like that of peach opal on camphor Thin Panels vases. (See Carl O. Burns, Dugan & Diamond Carnival Glass, p. 104.) Because the handle is murky rather than impenetrable to light passing through it, it is semitransparent instead of opaque. Applying a camphor, rather than a clear peach opal, handle to a carnival bowl may have been an experiment to determine if a new product line was feasible. 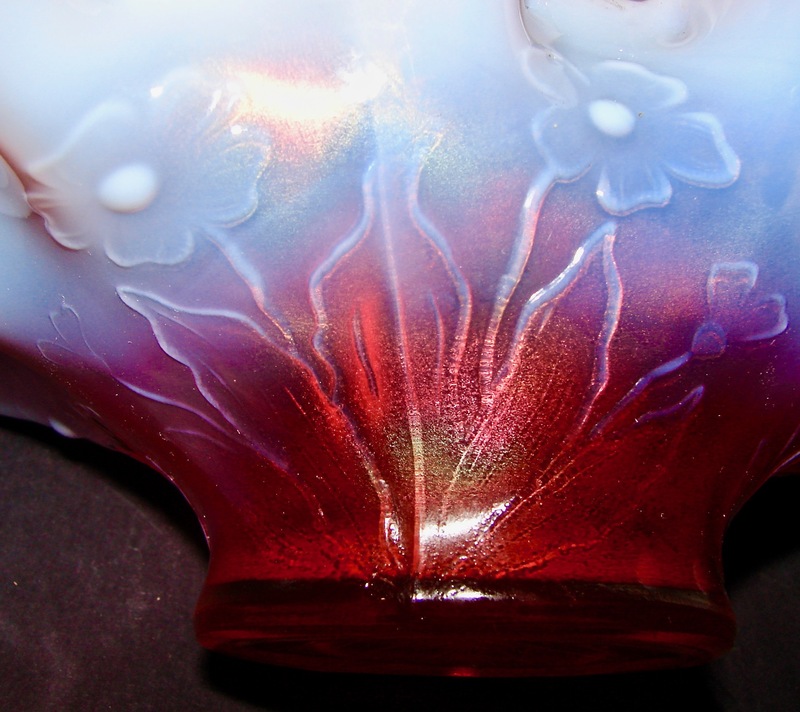 Or a glassmaker may have whimsically created a piece that combined carnival and camphor. Also seen occasionally are baskets with a metal handle that can be attached to (or removed from) the bowl. These, too, have been reported only in peach opal. Single Flower bowls are nine inches in diameter, give or take a small fraction of an inch one way or the other. They are available in an impressive array of shapes: broadly six-, eight-, and ten-ruffled, tri-cornered, handgrip, ten flat- (square-) ruffled, three-and-one, square, and non-ruffled round as well as the banana-shape to which the glass handle was attached to create the basket. Some of these shapes are known only with a smooth edge, others only with a tightly-crimped edge, still others available with both edge treatments. All are available in peach opal, some with factory-painted flowers and leaves adorning their interiors. 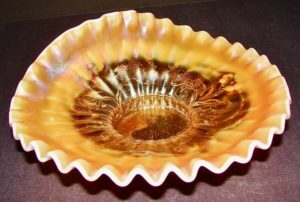 Single Flower bowls have also been reported in ame-thyst. The amethyst are extraordinarily difficult to track down, with the ratio of peach opal to purple probably in the range of 400 or 500:1. The amethyst have been confirmed in handgrip and non-ruffled deep round bowls, and they may also be available in other shapes. The obverse of the few that have been reported are beautifully iridized, their outer surface uniridized. 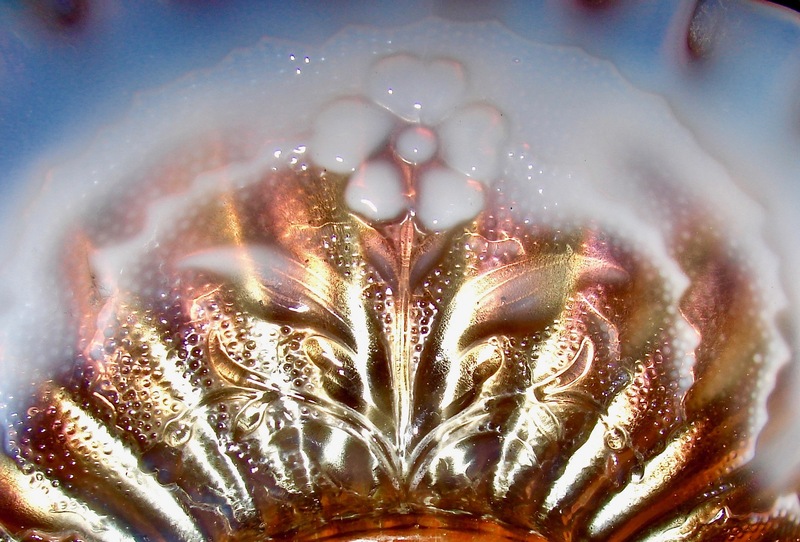 A Single Flower bowl described as sapphire blue sold in 2002 for $200. A dream come true would be to find an amethyst banana-shape bowl with factory attached amethyst handle. Despite low odds, it’s remotely possible it might exist, as Dugan made the Band basket in amethyst, receptacle and handle color-matched. Let’s put a factual error to rest once and for all, an inaccuracy that has persisted for far too long. Single Flower and Single Flower Framed are not the same pattern or one a variant of the other. They are distinctly different. The following description for Single Flower Framed can be compared to the one above for Single Flower. For a starter, Single Flower Framed is mold patterned on both surfaces. The interior is Sharp Rays, a pointed (not actually concave) rayed pattern that fills all but a silver-dollar-size open area directly above the base. The reverse is made up of three single flower-and-leaf sprays, each set within a generous stippled fan-like figure. Another difference is size. The largest shapes, tightly-crimped round and smooth-edge handgrip plates, are right around seven and one-half inches in diameter. 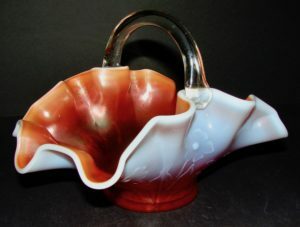 The other known shapes—broadly-ruffled, square-ruffled, and banana-shape bowls—are smaller yet, because of the shaping. The square-ruffled is the smallest, at about six and three-fourth inches in diameter. One last thing. The elevated base is two and one-half inches in diameter. On its underside is a faint, barely raised flower-and-leaf design set within an equally indistinct fan-like figure. Single Flower Framed is easily found in peach opal bowls and handgrip plates. Crimped-edge plates are difficult to track down. The pattern is also available in an almost-impossible-to-find amethyst. The only known shape in amethyst is a handgrip.